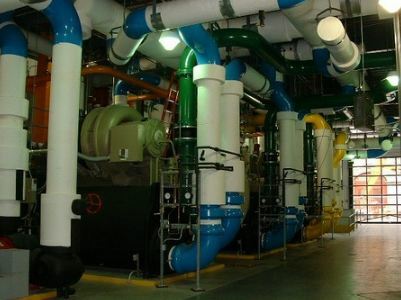 Leach Wallace Associates, Inc. designed the chilled water/ice plant, (designed for off-peak generation and storage of ice for use during peak electrical billing hours. The 16,000-ton system incorporated four centrifugal glycol chillers for ice building and peak chilled water production with four centrifugal water chillers for day/night operation. The glycol chillers operate to produce ice in the evenings, and if necessary, chilled water through plate and frame heat exchangers during the day, when cooling demands exceed the thermal ice storage capacity. Ice storage is provided through one 30,500 ton/hour above grade ice storage tank located within the building. Some of the other major system components include six 350 HP chilled water distribution pumps which are serving the secondary distribution loop to the Comfort Link customers, 10 rooftop induced draft cooling towers and 13.2 KV primary service. The secondary chilled water distribution loop was designed to be connected to the secondary distribution loop from Comfort Link Plant No. 1 in the Convention Center and Plant No. 2 (Market Center) at Saratoga and Eutaw Streets. Provisions were provided for the incorporation of future peak shaving generators that would be located in a neighboring building.